If you’re my mother, or one of my five fans, you may want to know where I’ll be at SDCC next week. If you’re not a fan of my work, you may still want to know where I’ll be, so you can stop by my booth and tell me all the reasons why you don’t like my work. If you are my nemesis, the dread navigator Ivan Kronauer, please ignore the following. 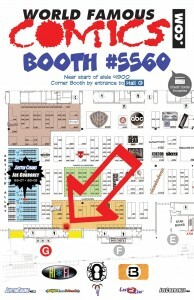 As is my custom, during the daylight hours, I’ll be with World Famous Comics at booth 5560 near the hall G doors. I will be joined by such luminaries as Justing Chung, Joe Corroney, Spencer Brinkerhoff III, HiFi Color, Val Hochberg, Last Kiss, Val Hochberg. We’ll be selling my two latest comic books, Tales From Lost Vegas and Tales From Fremont Street. We’ll also have the book Empire Of The Wolf, written by Michael Kogge,and illustrated by my friends Dan Parsons and David Rabbitte. We’ll have art prints from most of those people, and at least one from myself. Stop by and say “Hi.” Unless, and I really shouldn’t have to repeat this again, you’re my nemesis the dread navigator Ivan Kronauer, in which case I will not be in San Diego at all.